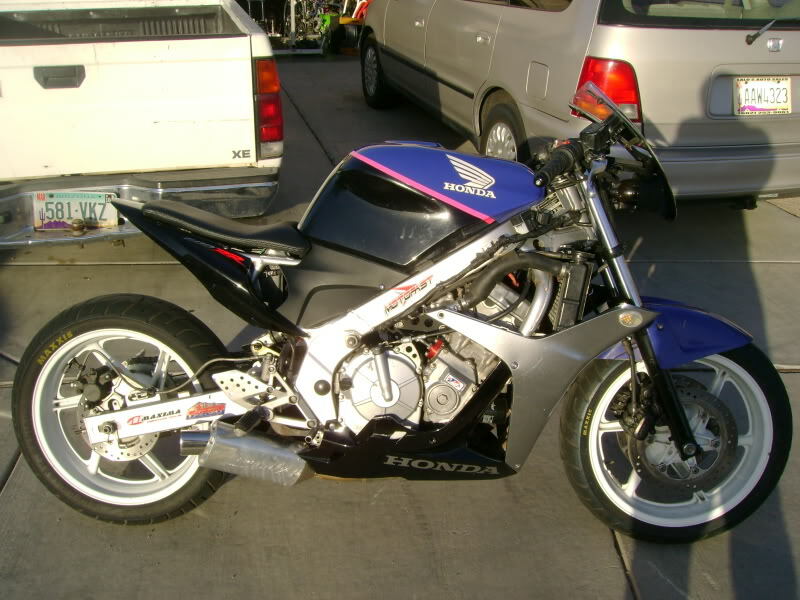 I started also the next is a similar bike but i'm installing an 06 R1 swingarm with a 190 wide tire, undertail exhaust with shortened pipe and chopped tail just like this one but with some 06 1000RR fairings and double projector beam headlight i took from an R6. I'll post pics as i progress on the project, right now still working on the adaptors for the swingarm and relocating the rear shock mount, originally wanted to install a VFR 750 single side swingarm but i cant find anything under 500 bucks for the whole kit and i have that R1 rear end laying around so here it goes. That is tight yo' lol. I really like it. Pretty damn cool. Nice yob! that bike looks awesome... my buddies and I are in the process of making a streetfighter out of a 99 f4. Hope it turns out as well as your did. great job. love the cbr1000 fairings. This bike is tight. What headlight/front end piece are you using? modified 07-08 CBR600RR front fairing and the headlight is from a bus but can use any projector light from other bikes or cars just take it off from the assembly. you said in the video how you chopped the rr fairing for the front w the bus projector! this bike is great but what i like most is your attitude! your ingenuity with making what you want out of any parts that come is right-on! some people worry about scratching their oem decals - its cool to find people who arent afraid to take it into their own hands and make a bike their own! i know its an old thread now but i hope you see this sometime- MUCH RESPECT! ps. where did you stash the other electrical units that usually live in the tail-section? i saw two boxes right under the seat but i know theres lots more parts to that harness?? again- i like your style man! The stock F2 battery box have a little extra space i put all the rest in there barelly fit lol, thanks for your comments, you can vote for it is on this month's Ride Of The Month nomination thread.